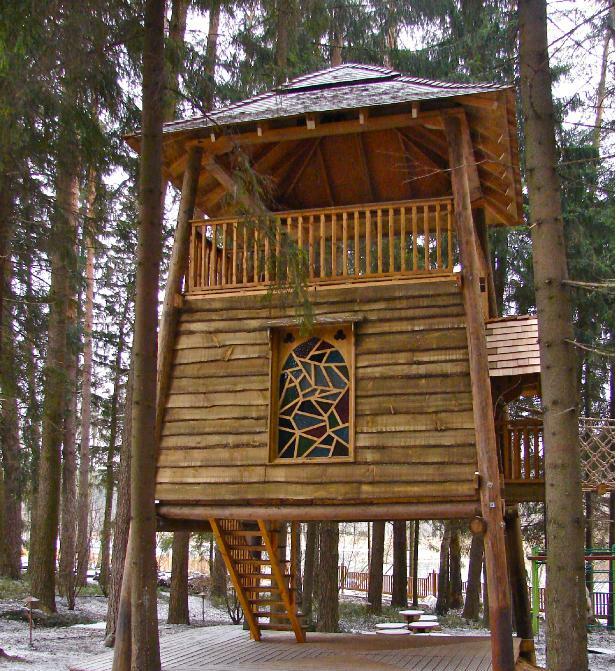 The Potter treehouse was built for a Russian family. It was constructed in the UK in a modular format and shipped to Russia. It was designed with quirky stain glass and entry from ground floor to an enclosed upper floor. The use of the treehouse was for entertainment, birdwatching and viewing the wildlife of the forest. Why we love this treehouse. The Russian Tree house enables over 25 people (all in the tree house at one time) to enjoy themselves in a great setting. The bottom floor can be enclosed, allowing for protection against the elements, for cooking and socialising. The middle floor can be used for sleeping and the upper floor for bird watching, sight seeing and for socialising. From the watercolour design to the completed treehouse in Russia, The Russian Treehouse was designed to convey height, fun and durability.